Berkeley Arts Magnet School at Whittier School offers a rigorous and inspiring curriculum in arts and academics. The school community values learning experiences in all domains, and consistently pledges funds and instructional time to incorporate visual arts, dramatic arts, music and dance into a comprehensive education program. Berkeley Arts Magnet teachers recognize the diversity of learners in each classroom, and have committed to ongoing professional development to promote academic achievement for all students. We invest in programs, materials and services to ensure this outcome. Committed families, students and staff who work together to create an lively and engaged learning community! Our parents and caregivers are an essential part of the school community, and take their responsibility as school partners seriously. 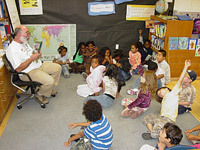 Volunteers and organizers support our children at the classroom, school, district and community levels. This is a school that can count on lots of family support, and this is a school that provides multiple opportunities for participation. All our family groups (PTA, United As Family, School Governance Council, and the BAM Giving Campaign) promote active participation, parent education, student achievement, and community celebration. Students will experience productions that draw on all genres; build self-confidence and pride; and provide an integrated/cross disciplinary approach to the arts. Students will know theory, history, skill, practice and discipline related to the art form; famous artists and art history; “self as artist”; and aesthetic valuing. BAM has been a great school for my kids. The dedication and enthusiasm to educate kids makes the teachers and staff special. We are working to reduce barriers to learning and to make the 2020 Vision a reality in our school. I see that daily in the work of our staff, the efforts of our students, and the support of our families.